Morning in ancient Carpatians begins here � on Hoverla mountain. Below it is still gloaming, valleys are covered with fogs, but this beautiful mountain already rests in the first rays of the sun. The mountain looks unusual beautiful. There are no words to describe it. Welcome to the Carpatians. Visit Hoverla by no means. Trip to Hoverla � it is a trip to the land of enigmatic beauty, ancient legends and heroic songs. And when you pass a dozen of kilometers, go along swift mountain streams meet sunrise on Hoverla you`ll surely come back here once again. A part of your heart will be left here forever. 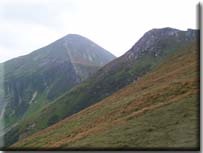 Hoverla is one of the tops at the most beautiful Chornogora range and the highest pick of the Ukrainian Carpathians. It is 2061m. height. 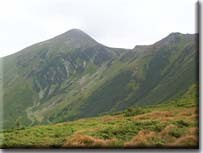 Hoverla like the whole Chornogora is praised in songs and tales. Here you`ll hear a lot of legends about Oleksa Dovbush � the fighter for freedom of the hutsuls. There were the most concealed and the most safe hiding places of opryshky. The legend says that somewhere in Chornogora Dovbush`s treasures are hidden�..
Wild and almost inaccessible in former times, Chornogora mountain today gives tourists a warm welcome. Visit spacious polonyny which are covered with thick carpets of flowers, listen to the chime of bells, on the necks of the grazing sheep. Listen to the shepherds playing horns. The voice of the trembita can be heard in this wonderful Carpathian symphony. With playing of trembita begins the festive seeing � off shepherds to the highmountain pastures. Chornogora massiv is the biggest one in the Carpathians. It occupies Ivano-Frankivsk and Transcarpathian regions. The flora and fauna of the massiv is very rich. Very often tourist meet brown bears, wild boars roe deer here. On the rocky offskirts of the range eagles make their nests, trout swims in streams. The climate and relief makes this region very popular among tourists. There is a small amount of precipitation in autumn. The fluctuation of the temperature is 17º-20ºC above zero.